Dear Parents! Do you want to improve your child creativity? Now, you can do it with with MyHero Education board. 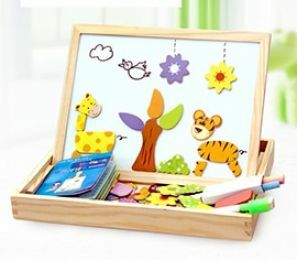 This is colorful drawing board with magnetic puzzles will entertain and develop your child at the same time. UNLIKE PHONES OR TABLETS THIS BOARD ACTUALLY HELPS YOUR KIDS BE SMARTER. This educational board is 2 sided. 1 side is perfect for drawing withmarker pen and playing with puzzles, 2 side is for drawing withchalks. This board also comes with 109 magnetic pieces for puzzle and ideas booklet. It helps to develop your child's cognition of animals, body parts and plants. All puzzles are easily combined with each other and it gives unlimited opportunities for your child creativity. That's whykids love it so much. > PLAY, DRAW AND DEVELOPE: With this board your child willdevelop creativity, painting and writing skills. > 2 SIDES = 2X MORE FUN: 1 side special designed for drawingwith marker pen and playing with puzzles. 2 side is perfect to drawingwith chalks. > EVERYTHING YOU NEED IN BOX. This board comes with set of chalk, marker pen, board eraser, 109 magnetic pieces for colorful puzzles and ideas booklet. > MORE THAN 1000 DIFFERENT COMBINATIONS: With help of ideas booklet your child can create different combinations. All puzzles are easily combined with each other and the child can finishpicture by marker pen or chalks. > MADE OUT OF 100% SAFE AND NON-TOXIC MATERIALS: The board is made out of natural wood. The high-quality surfaces of the boards, ink of the marker pen and chalks are non-toxic. > GREAT FOR SPENDING TIME AWAY FROM ELECTRONICS:Unlike phones or tablets this board actually helps your kids be smarter. Playing with board Your child will easily adapt to study in school. Also it is safe for eyes. > EASY TO STORAGE: Everything is simple to store in one wooden box. It save space and your kid will develop good habit of packaging, and keeping everything in order. WHAT'S THE BEST AGE FOR THIS TOY? This board specially designed to entertain & educate childrenbetween 3 to 7 years!